Orbital ATK announced its Minotaur IV space launch vehicle successfully launched and placed into orbit the U.S. Air Force’s Operationally Responsive Space-5 (ORS-5) spacecraft on August 26, 2017. 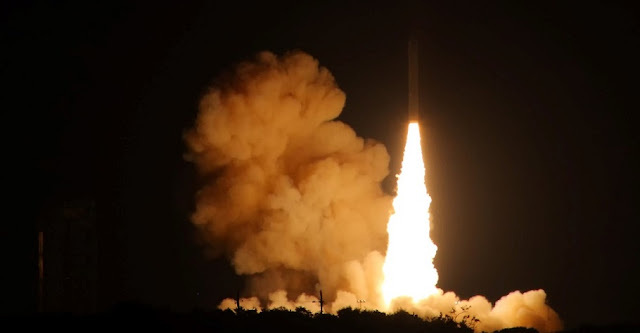 The Minotaur IV launched from Cape Canaveral Air Force Station’s Space Launch Complex 46 (SLC-46), which is operated under license by Space Florida. This mission marks the 26th consecutive successful launch for the company’s Minotaur product line. The rocket’s first stage ignited at 2:04 a.m. (EDT). Approximately 28 minutes later, the Minotaur IV deployed the ORS-5 satellite into its targeted low inclination orbit 372 miles (599 kilometers) above the earth. From this orbit, ORS-5 will deliver timely, reliable and accurate space situational awareness information to the United States Strategic Command through the Joint Space Operations Center. The Minotaur family of launch vehicles is based on government-furnished Peacekeeper and Minuteman rocket motors that Orbital ATK has upgraded and integrated with modern avionics and other subsystems to produce an affordable launcher based on flight-proven hardware. Minotaur rockets have now launched from ranges in California, Virginia, Alaska and Florida. The vehicles are procured under the OSP-3 contract administered by Kirtland Air Force Base. The ORS-5 launch was the sixth Minotaur IV flight. The Minotaur IV is capable of launching payloads up to 4,000 lbs. (or 1,800 kg.) to low-Earth orbit. This mission’s Minotaur IV configuration included three decommissioned Peacekeeper stages, an Orion 38 solid-fuel upper stage and an additional Orion 38 insertion stage for the payload. The Minotaur rockets are manufactured at Orbital ATK’s facilities in Chandler, Arizona; Vandenberg, California; and Clearfield and Magna, Utah. The ORS-5 team is led by the Space and Missile Systems Center’s Operationally Responsive Space Office, located at Kirtland Air Force Base, New Mexico. The Massachusetts Institute of Technology Lincoln Laboratory in Lexington, Massachusetts, is the ORS-5 prime contractor. The 50th Space Wing at Schriever AFB, Colorado Springs, Colorado, operates the ORS-5 system. The Air Force Space Command's Space and Missile Systems Center, located at Los Angeles Air Force Base, California, is the Air Force's center of acquisition excellence for acquiring and developing military space systems such as ORS-5. Its portfolio includes the Global Positioning System, military satellite communications, defense meteorological satellites, space launch and range systems, satellite control networks, space based infrared systems and space situational awareness capabilities.